Make this easy and best homemade Guacamole Dip at home in under 10 minutes. This Authentic Mexican Dip is healthy, Vegan, Gluten Free and super simple to make. Here is how to make Guacamole Recipe. Well, who doesn’t love guacamole? I don’t know anyone who said they don’t love this delicious dip that pairs well with tortilla chips or nachos. Apart form Tomato Salsa, Mango Salsa, this dip is my absolute fav. Who doesn’t know or crave about Chipotle’s guacamole? If you have had it once, there is no going back. It is the best it can get and what if I tell you that you can make it home and you won’t regret it. 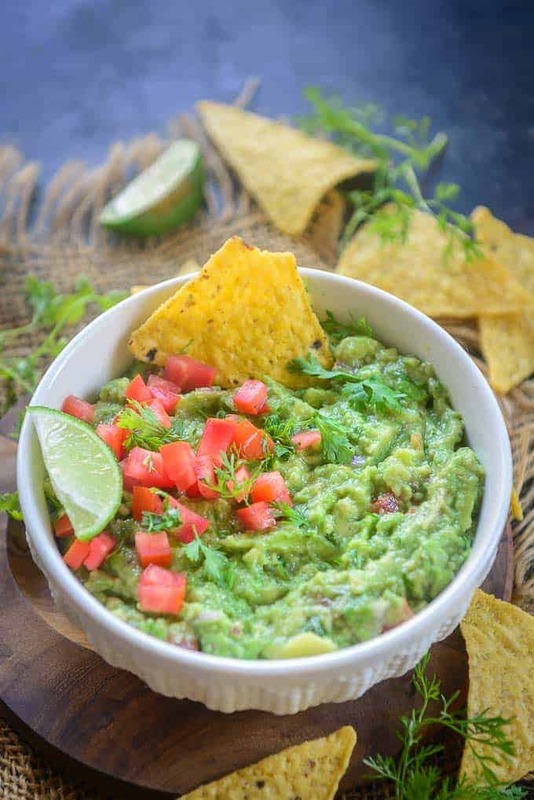 This easy and delicious guacamole dip can be made in no time and you are going to love the compliments that you are going to get for this no frills dip. To make authentic guacamole, you are going to need fresh, high-quality ingredients. It is important you use fresh and ripe avocado to get the best flavour. Let’s make this amazing authentic Mexican dip and get the party started. Guacamole is an avocado based dip which was originated in Mexico. It has become very popular in the US, infact the whole world now. How do you spell Guacamole? Guacamole taste the best when made fresh, so try to make it as and when you are ready to eat. But if you want to make it a little ahead, add extra lime juice to avoid browning. To make the best guacamole, you will need fresh and ripe avocado. Make sure you choose the right avocado. I have explained it below how to choose the avocado and find out whether it is ripe or not. Once you choose the right avocado, remove the skin and seed of avocado. Remove the skin of avocado when you are ready to use it, as it will start browning due to oxidation. Once you have removed the skin and seed of the avocado, lightly mash the fruit with your fingers or a fork. Now add chopped tomato, onion, minced garlic, chopped fresh coriander, finely chopped green chilli, salt, roasted cumin powder and lemon juice. It is important to have a balance of salt, lemon juice and red onion to make the perfect guacamole. If you like, you can even add a finely chopped jalapeños. Do not over mix otherwise it will be too mushy. Keep it chunky and serve immediately with nachos or any other crackers of your choice or however you like it. 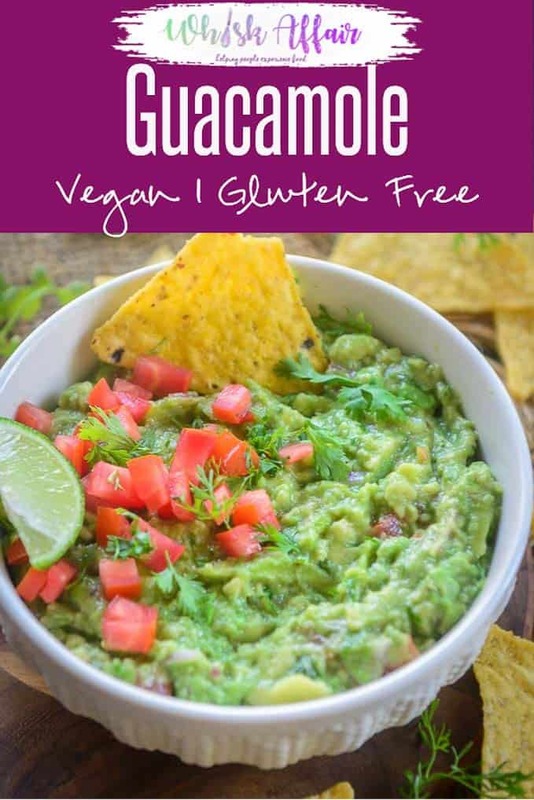 Guacamole uses all the fresh ingredients and is good for health too. Avocado are packed with good fats, vitamins, iron, magnesium, fiber and many other nutrients. It has more amount of potassium than bananas. Avocado help in lowering cholesterol and triglyceride levels. It is known to aid in weight loss as well. Avocado are loaded with antioxidants that are good for your eyes. As avocados are the main component of guacamole, you can guess how beneficial it is for you. 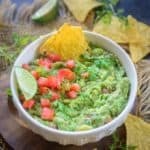 What to serve with Guacamole? Guacamole pairs well with burritos, tacos, nachos, chips and fajitas. You can use it in sandwiches, burgers, as a dip with your starters. Serve it in Buddha bowls or with burrito bowls. It makes for a great condiment. How to check if the avocado is ripe or not? Avocado doesn’t ripen on the tree. It ripens after harvesting, so it is important that you be careful while choosing the avocado in the supermarket. Ripe avocado will be dark in color, but check for any bruises. Then hold the avocado in your palm and put gentle pressure on it. Ripe avocado will yield to the pressure. If it is firm, then it is not ripe. If it yields to the pressure, it is ripe and ready to eat. If it feels mushy, it is overripe. While buying avocadoes, if you find only the firm ones, you can place them in a paper bag with bananas to fasten the ripening. Keep a check on the avocado and use them as and when they are ready. If you are not going to use the ripe avocado right away, then store them in the refrigerator, it will slow down the ripening. Guacamole is best eaten fresh. It doesn’t freeze well and also doesn’t taste as good as it does when made fresh. It can last in the refrigerator for 3-4 days but you will see discolouration on the upper layer. You can squeeze a little extra lemon juice over the top to avoid oxidation or cover immediately with a plastic wrap. If there is still discolouration, just scoop out the brown layer and discard. You can enjoy the rest of guac. People have various ways to make guacamole. So one of the ways 7UP suggests is to add some 7up to the guacamole to make it creamier and give it a twist. While adding lime juice, add 1/4 th cup of 7UP and mix well using a fork. To make chunky guacamole, dice avocado in small pieces and while mixing, don’t mash them. Also use chopped onions and tomatoes to make it chunkier. The trick to make a good guacamole is leaving chunks of avocado instead of mashing all of it. Remove the skin and seed of avocado and lightly mash the fruit with your fingers. Do not over mix otherwise it will be too mushy. Serve immediately with nachos or any other crackers of your choice.